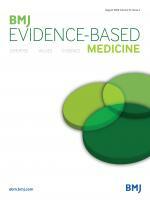 Evidence-Based Mental Health | EBMH is a summary of clinically relevant articles from a wide range of international medical journals. It is of relevance to psychiatrists and psychologists. Evidence-Based Mental Health (EBMH) updates researchers and mental health practitioners with clinical reviews, research and opinion on recent developments in the field and their clinical applications. EBMH also features case conferences, expert commentaries and practical statistics articles which enable clinicians to learn and apply an evidence-based approach to their own clinical practice. Submissions and article proposals are welcomed by the international editorial team, which is led by Professor Andrea Cipriani (University of Oxford). 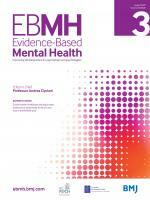 EBMH is co-owned by BMJ, the British Psychological Society and the Royal College of Psychiatry. The November issue of the journal is a special issue dedicated to progress in child and adolescent mental health. To view the special issue, click here. Evidence-Based Mental Health accepts submissions of a wide range of article types, including original research, reviews and perspective pieces. The Author Information section provides specific article requirements to help you turn your research into an article suitable for EBMH.